The web's first tool blog. The model in question is the HP 1802M Cordless Power Drill (pictured above courtesy of the CPSC) made in China and sold at Home Depot between January 2001 and July 2003. If you own one, the CPSC recommends that you immediately stop using it, remove the battery, and contact Ryobi at 800-597-9624 (between 10 a.m. and 7 p.m. ET Mon-Fri) to receive a free replacement drill. Happened to me a couple years ago, and it hurt! Dumped the thing and swore to never purchase another Ryobi POS again. I have been using that drill since 2001 with no problems. Well, even if you’ve been using it with no problems, it might be better to be safe than sorry. On the other hand though, you can still contact Ryobi and get a new free drill and be able to continue using the one you have if you’re that confidant in it. Not such a bad deal, overall. 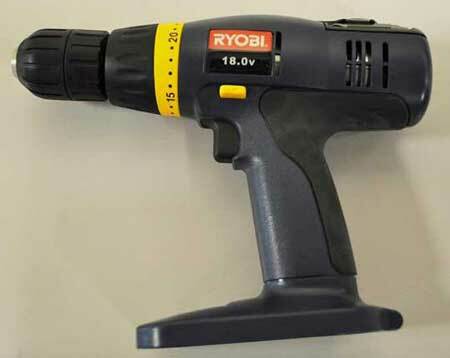 I just checked my Ryobi ONE+ drill, and it is not model 1802M. Not sure if I feel disappointed, or relieved. i really love my green li-ion ryobi drill & impact driver..
i am glad i didn’t opt for this line, though they are a steal. i read somewhere that those blue model Ryobis are essentially the same as the Craftsman c3 line.. or something abotu them is.. has me wondering. i have 2 of those, but the batteries are shot. @Nick: We, too, were impressed with the green li-ion Ryobi tools. When we got them in for test we had pretty low expectations (having had some negative experiences in the past) but were happily surprised. If there’s one thing we’ve learned testing a lot of tools it’s that you can never guess how good/bad a company’s next product will be. You really have to go into each test willing to revise any pre-existing condition you might have. Not sure sure, though, re: similarity to the C3. I have a C3 cordless — Funny: I bought it just before we started Toolmonger, actually — and it doesn’t look or feel anything like the one in the picture. I’ve had pretty good luck with my C3, except for the fact that the batteries die after a few years. But that’s to be expected of any NiCd drill, and it’s performed as well as other NiCds we’ve had in for test. Lucky me, I have the drill in question; I bought it because a friend who runs a theatre scene shop recommended it and while I’ve never had a lick of trouble, I agree it’s better to be safe than sorry. I just got off the phone with Ryobi; they’re having me box up the drill and leave it out for a FedEx pickup; once they have the drill in their hands they’ll ship a replacement so if you’re thinking you’ll still have a drill to use until you get the replacement, better think again. Fortunately I’m pretty well caught up on all the stuff I needed to get done before Halloween, and I still have a corded drill I can use if necessary. The CSR asked where I’d heard about the recall – of course I told her I found out at toolmonger.com! One of the three I own was this recall. Just got off the phone with Ryobi- same results as Office Bob. I also told them about this site. I alerted BT3Central.com to this site and the recall. Called Ryobi thursday, they are picking it up in two weeks. I guess a lot of people heard about the recall. Still have corded to use till I get the new drill. Definetly better to be safe than sorry. Good to see that Ryobi stands behind their tools. Especially since they are just basic and not professional quality. I like their tools, quality and price for what I would use it for. I am glad that their Li-Ion batteries fit my 18-one system which just increased their value (not that common in tools to increase previous value/performance). Also, opposed to other companies that just come out with a new battery that is different size and you get stuck paying more then what the tool is worth for an obsolete replacement battery. I called Ryobi and they are picking my drill up next week. They could not give me a model number of the replacement thou. Does any one know what model number they are replacing it with??? 1) The pickups only occur on Tuesday, Wednesday and Thursday and there’s a 3-day “window of opportunity” for pickup so just because they say it’ll be picked up on the 3rd of November, that’s not necessarily when it will happen…I found this out after calling back on the 4th to ask why my drill wasn’t picked up. 2) The toll-free number provided in the recall info isn’t the number you need to call if you’re in Canada…I found this out after calling back on the 10th to find out why my drill STILL hadn’t been picked up after the 3-day window had passed. 3) The new TF number they give you runs through through voice-navigation hell, at which point you’re told you should actually be calling yet ANOTHER TF number…but the machine will generously forward you itself. 4) The CSR you finally end up speaking to will have no explanation as to why you got the runaround and tell you that the first call should have taken care of everything, but she will take down your info gain and arrange another pickup. The new T/W/Th pickup window starts on the 18th…I’m not gonna hold my breath. Big thanks to the folks at Toolmonger for posting about this recall!!! I called Ryobi on Oct 19th, scheduled for a FedEx pickup on Nov 2nd and received my new drill today via FedEx…model P204. Contents of the box were the drill / drill bit inside a plastic bag along with a user manual. I am pretty sure I purchased the original one back in 2002 or 2003 as park of a combo pack on sale at the Depot…it still did the job but had seen plenty of abuse over the years and a new drill was definitely in my future. I just didn’t figure on it being a FREE one 🙂 Good stuff…thanks again for posting about the recall. Got my drill today, nine days from the day they picked it up. Like James said, it came in a box with the manual. Much nicer drill than the old one. are they sending just a new drill or does it have a battery too? They are sending just the drill, double sided bit, and manual.